Banana oatmeal cookies make an easy on-the-go breakfast or after school snack, and are the perfect way to use ripe bananas! I loathe winter. Actually I take that back. I loathe winter weather that goes from freezing to 40 degrees to rain to sunshine. The winter weather that’s started a gloomy 2017 here in Michigan has given a whole new meaning to germs and sickness with my trio. And I blame the weather!!!! And the fact that Anthony gives open mouth kisses to his siblings. Needless to say we’ve been homebound for a little over a week now with coughs, colds, and a case of bronchiolitis for Ms. Lily. There are only so many times I can watch The Lion King before digging in my heels, turning off the TV, and getting the kids in the kitchen [the healthy two] so we can bake. BAKE. Motherhood is making me do some crazy [delicious] things…. And bake we did. The boys were quite pleased to see chocolate chips on the counter when I was gathering ingredients for these banana oatmeal cookies. 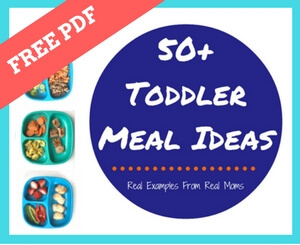 Want your toddler to help in the kitchen? Involve chocolate chips. Among other things… while Joey stirred the batter, Anthony asked questions [“when can I watch a movie??] and Lily was just hanging out, wishing she could have a chocolate chip I’m sure. Someone wasn’t interested in measuring the cinnamon. Filled with lots of delicious ingredients, these banana oatmeal cookies aren’t just for sick days. They are the perfect grab n’ go breakfast, treat for a lunchbox, or simple after school snack. They also go well with a glass or two of red, which you know I’m enjoying once my crew is in bed. So here’s to hoping your house is staying somewhat healthy this winter. And if not, then I think a batch or two of these banana oatmeal cookies should do the trick! Preheat oven to 350. In a large mixing bowl, combine bananas, peanut butter, and egg. Add oats, chia seeds, baking powder, vanilla, and cinnamon. Stir to combine. Fold in chocolate chips. Line baking sheet with parchment paper. Using a medium cookie scoop, scoop dough to form about 10-12 cookies. Flatten the top of each cookie and bake for 22-25 minutes. Allow cookies to cool on baking sheet before serving. Recipe adapted from Five Heart Home. Love the idea, but my son’s school is nut free. Any substitutions that would get the protein? Can they have seed butter? Sunflower butter or cashew butter come to mind!